There is a place in far southern Chile, in the remote region of Aysén, where the long road south—the famed Carreterra Austral—simply comes to an end. Beyond lies a magical and uninhabited land where the earthly elements combine in a breathtaking though at once intimidating mosaic of mountains, glaciers, lakes, and fjords. Home to the Southern Patagonian Ice Field, the largest in the world outside of Antarctica and Greenland, the region also boasts one of Chile's most powerful rivers, the Pascua, which flows from a hidden corner of Lago O'Higgins, South America's deepest lake (more than 830 meters). Few people in the world have ever seen the pristine, 62-kilometer Pascua, which until as recently as 1898 was completely unknown to European settlers. But the river is no longer completely anonymous, thanks to a controversial hydroelectric project being planned by Endesa, a Spanish-Italian enterprise, and Colb·n, a Chilean energy company owned by the influential Matte family. Via a joint entity called HidroAysén, the two companies look to build five massive dams in Aysén (Region XI) that would together generate some 2,750 megawatts of electricity—roughly equivalent to 20 percent of Chile's current overall generating capacity. Three of those dams are slated for the Pascua. The other two would be built along the Baker River, Chile's most voluminous river, which is located farther north. Backers of the project claim it is a necessary step toward satisfying Chile's growing appetite for electricity, which increases by an estimated 6 percent annually. Chile, a developing country, cannot expect to continue its leap toward so-called first world development without a plentiful supply of energy, they argue. HidroAysén's plans, however, have generated a formidable backlash. Activists from the region have joined forces with colleagues throughout the country and abroad to launch what some observers are already calling the biggest environmental campaign in Chile's history. Under the banner "Patagonia sin Represas" ("Patagonia without Dams"), campaign members insist the dams will cause irreversible damage to the Pascua and Baker Rivers. Even more troublesome, they say, are plans to build a 2,300-kilometer transmission line between Aysén and central Chile, where energy consumption is highest. Planned by Canadian-owned Transelec (Brookfield Asset Management), the power line would cut a 70-meter swath through countless acres of wilderness land, require 5,000 towers, and, once completed, be the world's longest. Before breaking ground, Endesa and Colb·n must first gain approval from the government's National Environmental Committee (CONAMA). The companies are expected to officially enter into the approval phase as early as March, when they plan to submit a requisite Environmental Impact Study (E.I.S.). The pending E.I.S. submission has given new urgency to the Patagonia sin Represas campaign. This January representatives from United States partner organizations International Rivers, a California-based nongovernmental organization, and the 1.2-million member Natural Resources Defense Council traveled to Chile for a series of meetings with their Chilean counterparts. Together, the myriad dam opponents call themselves the Chilean Patagonia Defense Council, an umbrella organization that includes members of the Region XI-based Citizen Coalition for Aysén Life Reserve. Several members of the Chilean Patagonia Defense Council also participated last month in an International Rivers-sponsored excursion into the Aysén wilds—a unique expedition that culminated in a seven-day backpacking trip along the far-away Pascua. "One of the things we discovered as we were invited to support the campaign by our Chilean friends is that other than its supposed hydroelectric potential, the Pascua River in particular is almost unknown," said International Rivers' Patagonia Campaign head Aaron Sanger. "It's a remote river. For that reason it's very pristine. It's a river that's difficult to reach, and that has protected it so far. 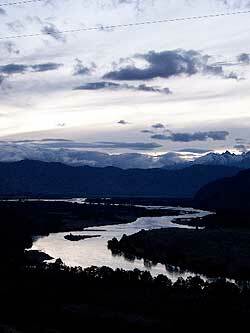 But HidroAysén has access to this river.… We need to claim this river for the Chilean people. The expedition is a tool to allow them to do that." The least populous of Chile's 15 regions, Aysén is in many ways the country's last frontier. Home to less than 100,000 people—more than half of them in Coyhaique, the regional capital—the far southern region is largely cut off from the rest of Chile by a labyrinthine coastline. Buses from Puerto Montt (Region X) (itself 14 hours south of Santiago) take 20 hours to reach Coyhaique and must first pass through Argentina before dipping back into Chile. Most visitors, therefore, arrive by plane. Travel within the region is also difficult. Only a handful of infrequent buses connect the towns along the Carreterra Austral, the single highway that links Coyhaique with the southern portions of Region XI, so most visitors travel either in private cars and trucks, or in chartered vans. From Coyhaique the Carreterra Austral winds its way south through wide-open pastureland framed in all directions by snow-topped mountains. Farms are littered with grey stumps and other tree remains, evidence of voracious fires that early 20th century settlers set in the zone to clear the land for livestock grazing. An early environmental disaster, the uncontrollable blazes razed millions of hectares throughout Aysén. Nearly a century later the region is still undergoing a slow recovery process. From there the highway climbs up and through the Cerro Castillo National Reserve, descending to a town of the same name that boasts a front row view of the breathtaking, cathedral-like Castillo peak. At that point the paved portion of the Carreterra Austral comes to an end. Cell phones no longer have signals. Towns are few and far between. Visitors suddenly find themselves lost in the landscape. The now dusty, gravel "highway" continues south, crossing several steely-blue rivers before eventually reaching Lago General Carrera, South America's second largest lake after Titicaca in Bolivia. Ringed by mountains on all sides, the lake shows off a mesmerizing, almost artificial looking aquamarine hue. Hugging the western coast of the General Carrera, the road eventually passes a tiny village called Puerto Bertrand, which besides boasting stunning views and numerous nearby fishing lodges, also marks the headwaters of the mighty Baker. Chile's largest river, the powerful Baker flows 182 kilometers from its birthplace in Lago Bertrand (an offshoot of Lago General Carrera) to the picturesque town of Tortel, where it deposits into a series of channels that eventually lead to the Pacific Ocean. A world-class destination for fly-fishing and rafting, the Baker river valley might soon house two huge reservoirs. Along its descent toward the sea, the Baker passes the Estancia Chacabuco, a 78,000-hectare chunk of pristine Patagonian steppe land owned by United States enviro-philanthropists Douglass and Kristine McDivitt Tompkins. Just as they did with Region X's Parque Pumalín, the couple plans to eventually donate the property to the Chilean government, which they hope will combine the land with the nearby Lago General Carrera and Lago Cochrane National Reserves to form a massive national park. "This is an epic environmental fight here. The biggest one that Chile's ever seen," Doug Tompkins told The Patagonia Times. "And it's attracting a lot of attention. Because this is a mega-monster project. They're talking about running these friggin' power lines all the way up to Santiago and they're going to disfigure the landscapes between here and there." "The impact of the wires is far greater than the dams," he added "Of course, they're trying to concentrate on the dams. The dam guys are saying, 'Well, we're not flooding that much. The containments aren't that big.' But that's not where the real impact is. They're talking about 20 million hectares of impact in one way or another all the way to Santiago. This is a big deal." The involvement in the campaign of people like Tompkins—a veritable celebrity figure here in Chile—and high-profile United States N.G.O. 's such as the Natural Resources Defense Council, International Rivers, Sierra Club and others has indeed attracted an increasing amount of attention to the HidroAysén dam project. The N.R.D.C. and I.R., in particular, have contributed significant funding—money that's gone toward newspaper ads, anti-dam billboards, and an ongoing study into Chile's energy alternatives. The Chilean campaigners agree. "The campaign was born in Aysén," said Hartmann, who has been fighting industrial encroachment in the area long before HidroAysén finally went public with its plans to dam the Baker and Pascua. Hartmann and his colleagues insist the dams and transmission line will ruin the rivers, brand an unpardonable scar on the landscape, and undermine the area's potential as a top tourist destination. "There are 145,000 tourists coming (to Chile) every year. They leave about $80 million in the country. What's going to happen if they build the dams? How many fewer tourists will that mean for the region? How many tourism jobs will be lost? Are Mr. [Bernardo] Matte and Endesa going to give all that money and those jobs back to the country? Of course not," said Rodrigo. At a nearby, riverside bed and breakfast owned by a pair of Santiago transplants, proprietor Marisol Ross shared a similar, though in many ways more intimate concern. "Intervening in the river would just be a sacrilege… because it would change everything," she said. "Nature already has a harmonic order to it. It doesn't make any sense to alter it mechanically. All one has to do is observe natures cycles to see that on its own everything works well. But as soon as we start altering things, that's when you get problems. It's not just about tourism, but about all the species that are here: birds, fish, animals, plants, everything." Sacrilege or not, plans to dam the Baker and Pascua are moving full steam ahead. Framing the venture as a "national project," Endesa and Colb·n wield a tremendous amount of influence among central Chile's urban-based decision makers. Energy is a hot button issue at the moment, especially given problems in recent years stemming from supply cuts of Argentine natural gas, which Chile uses to generate a good portion of its electricity. Chile, in other words, needs to secure affordable and preferably domestic sources of electricity, something the two companies, which together generate more than 70 percent of the country's supply, say they're ready to provide. HidroAysén's influence is apparent in the small, isolated communities of Aysén as well. In Cochrane, a town of some 3,000 people located just a few miles from the Baker, the company has set up a busy field office. In the town's most popular restaurant, a waitress jots down customers' orders with a HidroAysén pen. To her left is a rack of free postcards featuring picturesque local landscapes and scenes adorned with the slogan "HidroAysén: La Energía que nos mueve" ("the energy that moves us"). Posters throughout Cochrane announce an upcoming basketball game between a visiting United States team and a squad of local all stars. Admission is 1,000 pesos ($2). The posters list HidroAysén as one of the sponsors. Endesa and Colb·n say the dams will create as many as 4,000 jobs. They've also promised cheaper electricity rates for the region, where utility costs are well above the national average. More generally, the project is being presented as a major step toward developing the region. A visit to the very end of the Carreterra Austral, which seems to get dustier and even more precarious as it heads south, offers a glimpse into why some of those promises might resonate among the region's scattered inhabitants. The road's final stretch, completed just eight years ago, ends in a town called Villa O'Higgins, population 477. Like most of Aysén, Villa O'Higgins has relied traditionally on livestock farming. More recently, since the road opened up, a small tourism industry has begun to take hold—at least in the summer months. There are a handful of general stores. A restaurant or two. Much of the money that comes into the town, however, comes by way of the state. The municipality employs about 80 people. In the town center, a number of men are hard at work putting the finishing touches on a new school—paid for with government money. "We're very fragile down here," explained Marco Fierro, a municipal administrator. "Not just from an ecological point of view… socially as well. So when someone comes along and says 'hey, 3,000 new jobs, we'll pave the road to Puerto Yungay, cheaper light bills,' that's very seductive. That draws a lot of people in." Unlike in nearby Tortel, where Mayor Bernardo Lopez recently came out against the dam project, municipal leaders in Villa O'Higgins are for the time being reserving judgment on the project, putting their faith in CONAMA's environmental evaluation process. "I wish they'd showed some concern about Villa O'Higgins' development before this issue came up," said Fierro. "More than just saying, 'no, we don't want this,' or 'yes, we want this,' it would have been nice if they were concerned before. Because this issue will pass. And the most likely thing is that they'll forget about us all over again." At first light the Pascua River expedition embarks from Villa O'Higgins aboard the L.M. Quetru, a tour ship that chugs its way for more than five hours through the massive Lago O'Higgins—a multi-fingered lake that's fed by the nearby, 16,800-square kilometer Southern Patagonian Ice Field. The lake is welcomingly calm. A summer heat wave makes the voyage all the more enjoyable. Mountains rise up in all directions, many covered in massive, glowing blue glaciers. Except for one small farm located on the lakeshore a few kilometers past our launch point, there are no signs of human life—no houses, roads, telephone wires. Absolutely nothing. In a far corner of the lake the ship finally comes to a stop. Rising to one side are a set of four jaw-dropping, ice-capped mountain spires. Before us stretches a perfectly calm, turquoise bay whose luminous color radiates in the bright austral sun. Maybe a hundred meters beyond the water narrows into a channel. The shoreline is covered in white and yellow wildflowers that contrast sharply with the milky blue water and the dark green, virgin foliage that blankets the surrounding hills. A pair of inflatable rafts transports the visitors to the mouth of the channel. We forge a trail alongside the narrow body of water, which now begins to reveal itself for what it is, a river—the Pascua. For about a kilometer the visitors follow the nascent river until it bends sharply to the right, and then suddenly drops, sharply down, in a rush of frighteningly powerful white water. We're told that only a few hundred people have ever visited this precise spot. It's quite simply perfect. The sense of privilege is overwhelming.